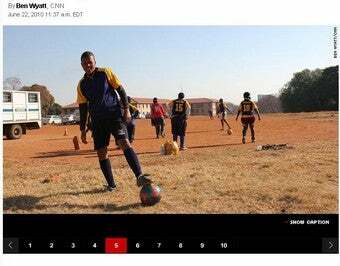 With all the coverage of potential danger to women caused by the World Cup, it's nice to hear about a group empowered by the event: South African lesbian footballers. I love football, it is the only thing that kept me going when I was being hurt by what was happening at home and in my community. Soccer is my life. I watched many, many World Cup games. I'm really enjoying it [and now] I want to be like Siphiwe Tshabalala [the scorer of South Africa's sensational opening goal of the event]. The way he ran through the ball and struck the shot... I want to be like him, I want those skills — I love that goal so much! Stories about women's sports in South Africa haven't been so happy recently — and some have expressed fears that the World Cup could increase violence against women worldwide. In the midst of all this, it's nice to remember that athletics can actually be empowering — in this case, for a group society tries hard to disempower.